I hope that OPEC, if possible, understands that if they could put more supply on the market it would be helpful. But a lot of these economies are going -- a lot of these oil-producing countries are full out. There are various definitions of peak oil - the "hard" one being actually declining production, with a "soft" version being production unable to catch up with latent demand and prices increasing instead. Then you can measure it for oil alone, or for oil plus various liquid substitutes that we are increasingly using (ethanol, processed tar sands, coal-to-liquids, etc...). I also understand the dynamics behind the issue, and that is growing demand from U.S., but more particularly, China and India, relative to supply. Oil is a commodity; it isn't something you just turn a tap. I mean, it requires investment, exploration, a lot of capital. I talked to His Majesty early on in my presidency in the hopes that they would explore for new fields; they have. They've increased their capacity. But in the meantime, demand has gone up quite substantially. 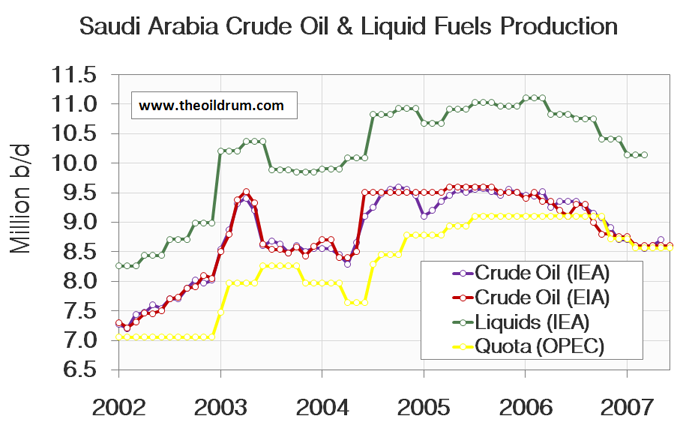 as this graph over at the oil drum suggests, production has been flat for a large part of 2007, which means that Saudi Arabia, holder of 22% of world reserves - and 30% of OPEC reserves) grandly increased its production by 1.5mb/d in 10 years, when demand increased by 10 mb/d (or 8mb/d since 2000), ie much below its supposed share of the remaining resource. If they are producing "full out", having increase capacity, we're in trouble because, as Bush states, demand has not stood still in the meantime - and that demand, in a major change from the past, is not coming from the US, but from China, India, and the oil producers themselves (BP statistics show that Saudi internal consumption jumped from 1.5mb/d in 2000 to 2.0mb/d, which means that fully one third of Saudi Arabia's production increase went to domestic demand). Again, Bush is at least accknoledging the "soft" version of peak oil. I would like for them to realize that high energy prices affect the economies of consuming nations. And that if these economies weaken, those economies will eventually be buying fewer barrels of oil. And having said that, there is not a lot of excess capacity in the marketplace. What's happened is, is that demand for energy has outstripped new supply. And that's why there's high price. That's the third time he said it. It may sound like "it's not my fault" and "it's not my pals the Saudis' fault either", but it certainly is quite an admission of helplessness viz. reality. Will that lead to actual policies to solve the issue? We know that it won't until 2009, but it would be nice if the Democratic candidates jumped on this admission to push for radical energy reform. Wow. So Junior essentially grasps the issue (and perhaps better than any presidential candidate), yet implements policies that make the problem worse. All views expressed are my own but you knew that. It was more for the here and now stability of the Gulf and for Israel. Saddam was problematic for all parties, so he had to go. Cheney and the boys like endgame strategies; they are not much for uncertainty. It was supposed to send a message about American power as well. No doubt it was deemed a win-win situation with little downside. They took pressure off the Gulf states and Israel. They could create a laissez-faire utopia to prove their ideology. They could now focus attention on the other "contained" state in the region- Iran and they set themselves up in a forward position for the future. They can protect the resources and keep them flowing West and they can get in on lucrative oil deals as supply and demand head in opposite directions. Had it gone the way they planned, the Iraq Oil Law would long since be in place with juicy contracts all round. Hi, Elras! Welcome to ET! Bu$hCo™ has a plan...drilling in the arctic, now that the northwest passage is navigable nearly year round. next up on the energy agenda is drilling in the anwr. Lets hope so, but I seriously doubt any new policies will make as much sense as many of those I've seen advocated on this forum.